On several occasions I have seen Deep Friend Ice-cream on menus at various restaurants and have wanted to try the dessert. However, the portion sizes are often quite large, leaving little room for the sweet delights. 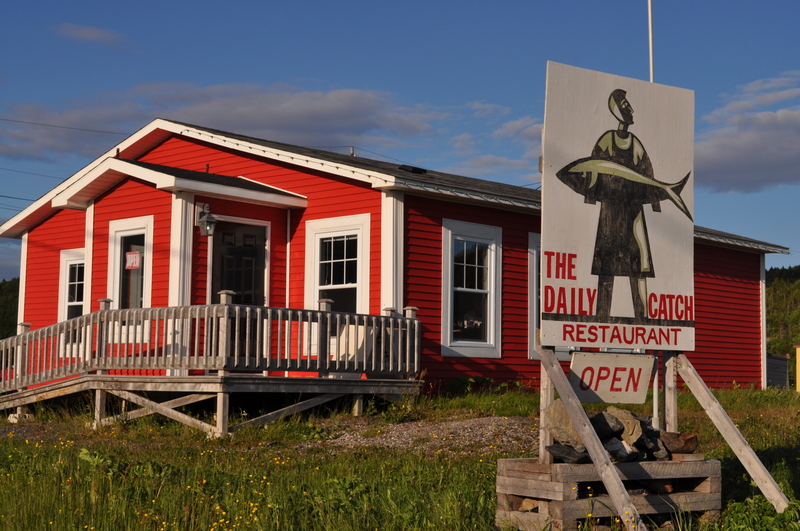 The The Daily Catch Restaurant in St. Lunaire-Griquet, en route to L’Anse Aux Meadows (World UNESCO Heritage Site) specializes in seafood. The food is delightful. In fact, they were even mentioned in the Globe and Mail. This is a true gem of the North, with superior food, excellent menu options, great wine list and the atmosphere to match. I have enjoyed the pleasure of the cook’s culinary skills a few times at this venue. 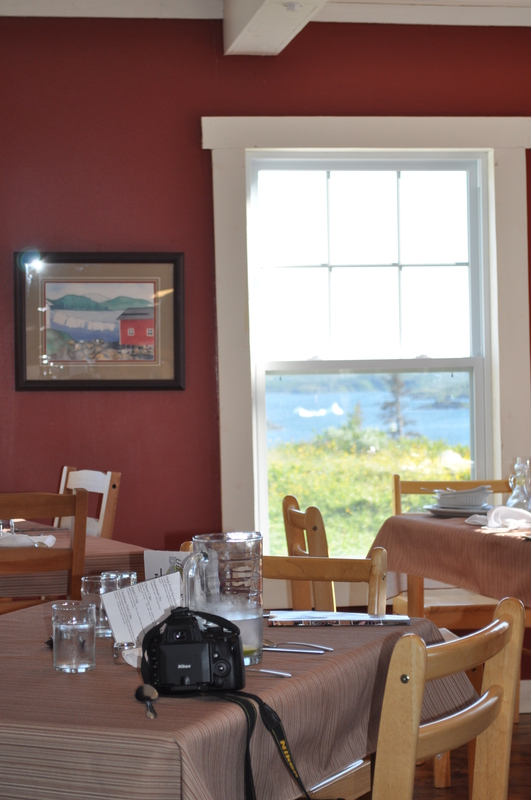 They produce inviting salads, savouring seafood mains and create a happy mood as the traditional Newfoundland & Labrador music plays in the background. 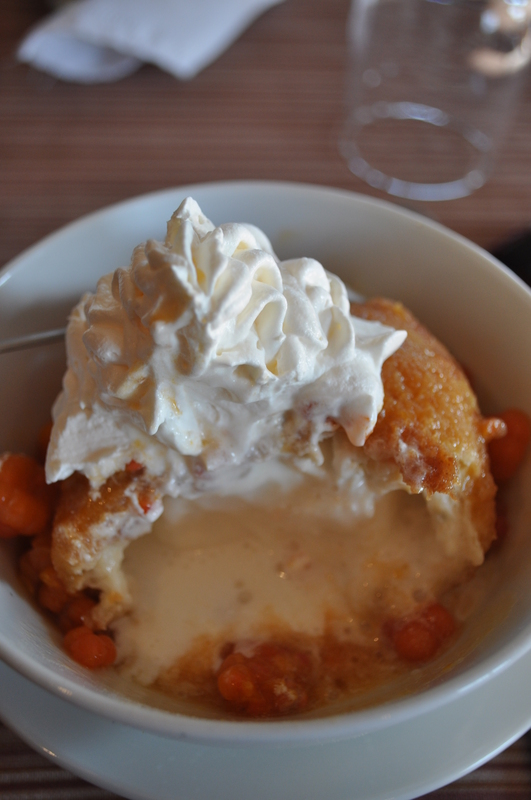 Today was my time to shine – I was prepared and would certainly get my must have treat of Deep Fried Ice-cream today. I ordered up their Drink of the Day, which was a surprise concoction known only by the server. 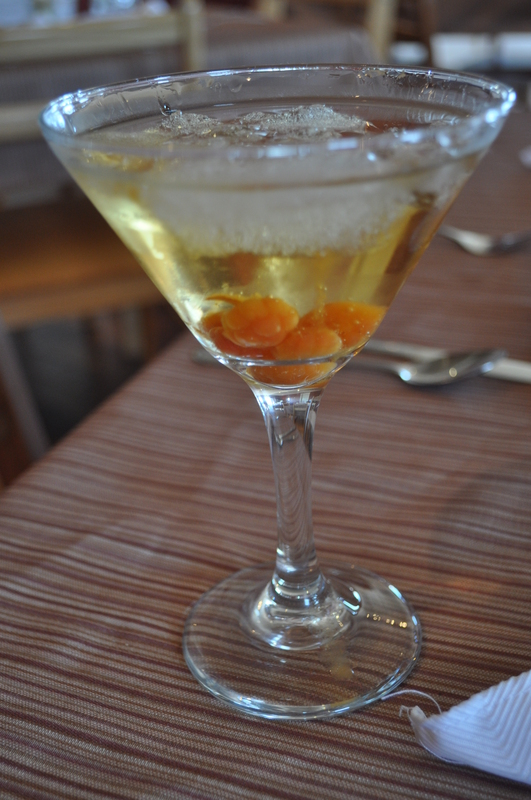 I was presented with a bakeapple flavoured martini, which had the traditional berries at the bottom and was topped off with real iceberg ice. The iceberg ice really adds to experience, with purity and crackles as the shards gently melt. In 2010, a Youth Ventures participant pursued bagging the shards of icebergs as ice to sell during summertime at a local service station. Why are we not selling the ice on a larger scale? Opportunity knocks. As I awaited my appetizer – the steamed mussels, I took notice of the two icebergs positioned perfectly in view of the two windows in front of where I was sitting. I struck up a conversation with the table adjacent. We talked about icebergs, local area, opportunities, culinary experiences and more. It was so fluent that I did not take a picture of the delicious mussels. However, I would not forget to snap my first trial with delectable Deep Fried Ice-cream. The dessert menu claimed this is a “Must Have Treat”. It had the option of being served with Partridgeberry or Bakeapple. 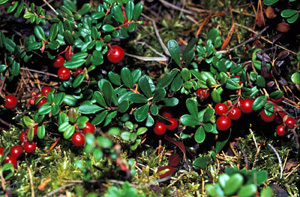 I am a fan of the bakeapple, as I find the partridgeberry a little tart. Served with whipped cream, a generous portion of local berries and wrapped in a secret coating – certainly makes this a field trip for the taste buds. A nicely brewed cup of coffee with deep friend ice-cream was a culinary experience. I only wondered if this could have been enhanced, if I added some of my Screech Chocolate Sauce, purchased earlier at the Dark Tickle Company just a short jaunt down the road. I left the Daily Catch completely satisfied, which is no surprise. So local or traveller alike, if you have never tried this treat, you can at this venue for a price of $4.75. Get lost in a world of experiences on the Great Northern Peninsula of Newfoundland & Labrador.